The weather is an unpredictable thing. It is only in modern times that we even have the scientific ability to make educated guesses as to the coming week’s climate and precipitation. Through the miracle of satellites, not only are we able to reasonably predict the weather, but we are able to protect ourselves against perilous storms that might injure or even kill us. We stay indoors when a lightning storm is approaching. We cancel activities and stay off the roads when heavy snow is forecast and we stay off the water when rains and heavy winds are predicted. Over the centuries many a soul has lost his or her life to the unforeseen perils of mother-nature. History is replete with such tragedies! So oft-times we forget how those of old must have felt when a storm quickly arose and threatened their very lives. Without the modern-day weatherman as their guide, many a person lost their life in such circumstances. Saint Mark tells an interesting story as recorded in his gospel. “…and when they were alone, he expounded all things to his disciples. And the same day, when the even was come, he saith unto them, Let us pass over unto the other side. 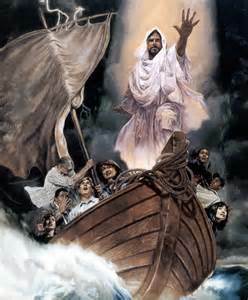 And…they took him even as he was in the ship…And there arose a great storm of wind, and the waves beat into the ship, so that it was now full. And he was in the hinder part of the ship, asleep on a pillow: and they awake him, and say unto him, Master, carest thou not that we parish? And he arose, an rebuked the wind, and said unto the sea, Peace, be still. And the wind ceased, and there was a great calm. And he said unto them, Why are ye so fearful? how is it that ye have no faith? (Mark 4: 34-40). The “Master” in this story is, of course, Jesus Christ. Now I have never been in a sinking boat before, but I might imagine that it is quite frightening. And although it is easily understood why the disciples were fearful, have we ever studied out in our minds what the Savior was trying to teach them when he responded back to them, “Why are ye so fearful, how is it that ye have no faith?” (vs. 40). Faith? Faith in what? I believe the Savior was teaching them that when they were with him, they were safe. If he was in the boat, nothing was going to happen because He was the Son of God. He was asking them why they didn’t have faith in Him and His divine calling! In essence, He was asking them why they doubted him!